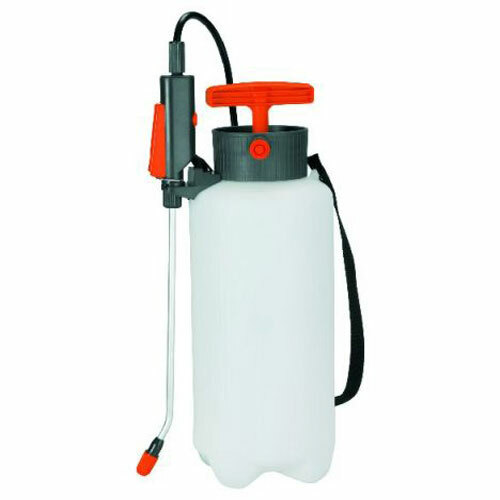 Gardena 5ltr Pressure Sprayer Incl. Container & Lance provides a convenient shoulder carried spray tank for chemical / liquid spraying in the garden or plot. Manual pump action pressurised container allows air pressure to be loaded into air gap at top of container. Lance includes an angled nozzle fully adjustable from a single jet to a fine mist, with a safety valve allowing manual pressure release. Spray trigger with lock makes chemical application to a large area easy to direct and control. Container includes a filling level indicator and has a 5 litre capacity, supplied with shoulder strap and spray lance holder.